Second stretchgoal reached and new builds! We’ve got our second stretchgoal through both Kickstarter and the Paypal donations! We hope we can get many more so that you, our users, get to choose more ways for us to improve Krita. And we have got half a third stretch goal actually implemented: modifier keys for selections! Oh — and check out Wolthera’s updated brush packs! There are brush packs for inking, painting, filters (with a new heal brush! ), washes, flow-normal maps, doodle brushes, experimental brushes and the awesome lace brush in the SFX brush pack! We’ve had a really busy week. We already gave you an idea of our latest test-build on Monday, but we had to hold back because of the revived crash file recovery wizard on windows… that liked to crash. But it’s fixed now, and we’ve got new builds for you! So what is exactly new in this build? Especially interesting are all the improvements to PSD import/export support. Yesterday we learned that Katarzyna uses PSD as her working format when working with Krita — we still don’t recommend that, but it’s easier now! Check the pass-through switch in the group layer entry in the layerbox! Dmitry implemented Pass-Through mode for group layers. Note: filter, transform and transparency masks and pass-through mode don’t work together yet, but loading and saving groups from and to PSD now does! Pass-through is not a fake blending mode as in Photoshop: it is a switch on the group layer. See the screenshot! We now can load and save layerstyles, with patterns from PSD files! Get out your dusty PSDs for testing! When using Krita with a translation active on windows, the delay on starting a stroke is a bit less, but we’re still working on eliminating that delay completely. Fix some issues with finding templates. Fix the autosave recovery dialog on Windows for unnamed autosaves! Added a warning for intel users who may still be dealing with the broken driver. If Krita works fine for you, just click okay. If not, update your drivers! New builds for Linux are being created at the moment and will be available through the usual channels. 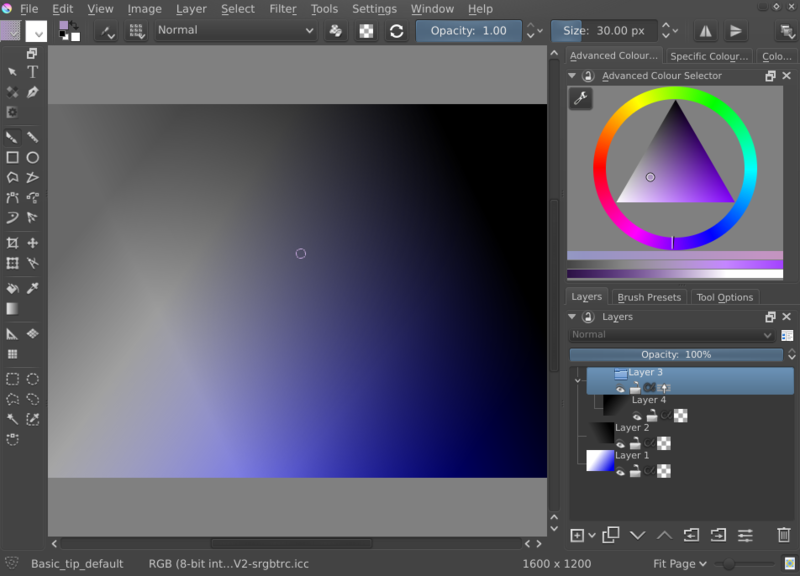 Users of Ubuntu and derivatives can use Krita Lime, as usual: https://launchpad.net/~dimula73/+archive/ubuntu/krita. Currently rebuilding: builds will be ready later today! From Vista and up, Windows 7 and up is recommended. There is no Windows XP build. If you have a 64 bits version of Windows, don’t use the 32 bits build! The zip files do not need installing, just unpacking, but do not come with the Visual Studio C runtime that is included in the msi installer.